The market’s outstanding performance in the first quarter of 2019 can almost single-handedly be attributed to a sea-change in investor perception about the direction and pace of the Federal Reserve’s monetary policy. Up until last year’s painful sell-off, the Fed was believed to be committed to “normalizing” interest rates by hiking the fed funds rate and by shrinking its bloated balance sheet after three rounds of Quantitative Easing. 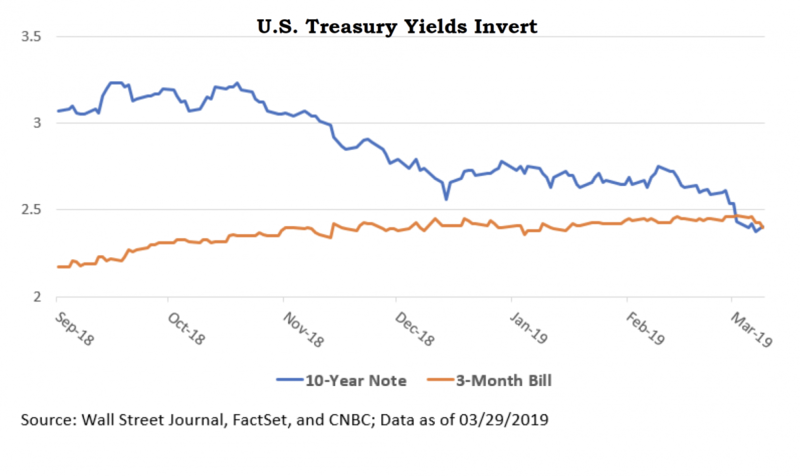 It would do the latter by allowing its holdings of mortgage-backed securities (MBS) and Treasury bonds to roll-off as they matured (up to $50 billion per month). The Fed’s rate hike program, which began in December 2015, has produced a total of nine hikes in the federal funds rate over the past three years, most recently in December 2018, increasing the rate to a range of 2.25%-2.50% from near 0% three years ago. What happened to change investor perception from negative to positive? Investor perception swung from negative to positive primarily due to a belief that the FOMC (Federal Open Market Committee) was no longer committed to raising rates two or three times in 2019 and may have already hit the neutral target for which it was aiming. The upswing in momentum carried throughout the first quarter and produced impressive gains across most major indices. Investors who sold amidst the pull-back, or delayed plans for additional purchases, missed a great money-making opportunity. Patient and committed equity investors were amply rewarded during 1Q19, booking gains across the board, led by U.S. mid-cap companies (S&P Midcap 400), up 14.5% for the period. Even international markets, which had recently disappointed, produced handsome returns nearing 10% each from developed (MSCI EAFE) and emerging markets (MSCI EM). If the year ended after the first quarter, most broad-based equity returns would be above long-term annual averages. Slow and steady usually wins the race. Signals have been mixed of late for the U.S. economy as evidenced by readings on the jobs front. Non-farm payrolls for February surprised to the negative with a gain of only 20,000 new jobs compared to a consensus forecast of 181,000. However, each of the prior two months saw upward revisions resulting in a healthy three-month average gain of 186,000. Economic growth, as measured by GDP (Growth Domestic Product), came in at 2.9% for all of 2018, the second strongest growth rate in our now, almost 10-year old expansion. The latest estimates by the FOMC is for a slower, yet steady 1.75% first quarter growth rate (traditionally a slow quarter) and 2.1% for the full year 2019. Tariffs on trade and slower growing global trading partners are impacting U.S. economic output. Inflation is running below the Fed’s forecasts and the unemployment rate now sits at 3.8%. Existing home sales are surprising to the upside as homebuyers rush to lock in lower mortgage rates. Housing is a major contributor to the economy, not only because of the labor and materials required to build a home, but also because of the ancillary items such as furniture and accessories that accompany a home purchase. U.S. - China trade negotiations seem to have bogged down once again. Attempts by British Prime Minister Theresa May to negotiate a smooth exit from the EU have repeatedly failed and could put near-term trade between the UK and Europe in question. Globally, most countries’ economies are slowing and the ECB (European Central Bank) recently announced it would launch new stimulus efforts to support the eurozone economy and keep its key interest rate at zero (yep that’s 0.00%) through 2019, longer than previously anticipated. Oil prices rose 32% in the year’s first quarter propelled higher by attempts from OPEC countries to curb supply and central banks efforts to ease global growth fears. Back in the U.S., inflation is still below the fed’s estimates, even with wage gains in February at a 10-year high of 3.4%. This is partially due to increases in productivity which can directly offset wage pressures. 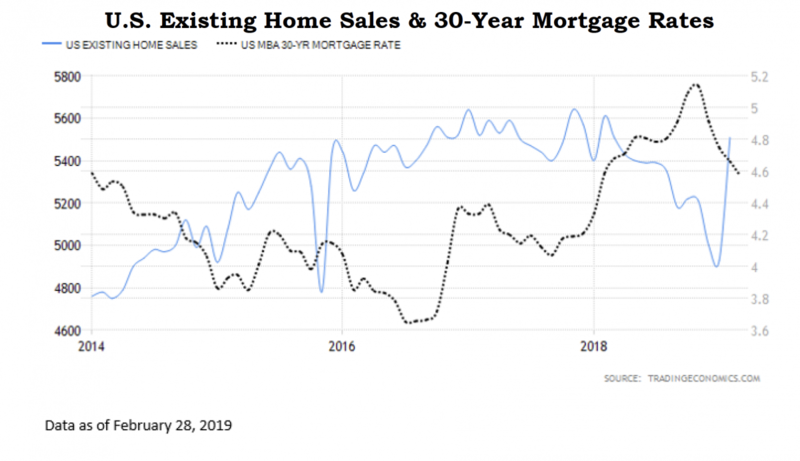 And home sales, as mentioned earlier, are rebounding thanks to falling mortgage rates. Investor perception merged with reality when after its March 19-20th meeting, the FOMC pivoted away from its prior position, indicating it will hold its benchmark rate steady at current levels and halt the shrinking of its balance sheet by the end of September, exactly two years after that shrinking process began. According to Fed Chairman, Jerome Powell, “The U.S. economy is in a good place and we will use our monetary policy tools to keep it there.” Hinting that interest rates could be on hold indefinitely, he went on to say, “It may be some time before the outlook for jobs and inflation calls clearly for a change in policy.” My, oh, my, how quickly things change. Markets are, and always will be, unpredictable. There are simply too many variables that can impact markets which cannot be foreseen on a consistent basis. For proof, look no further than stocks and bonds’ reaction in the quarter just ended. 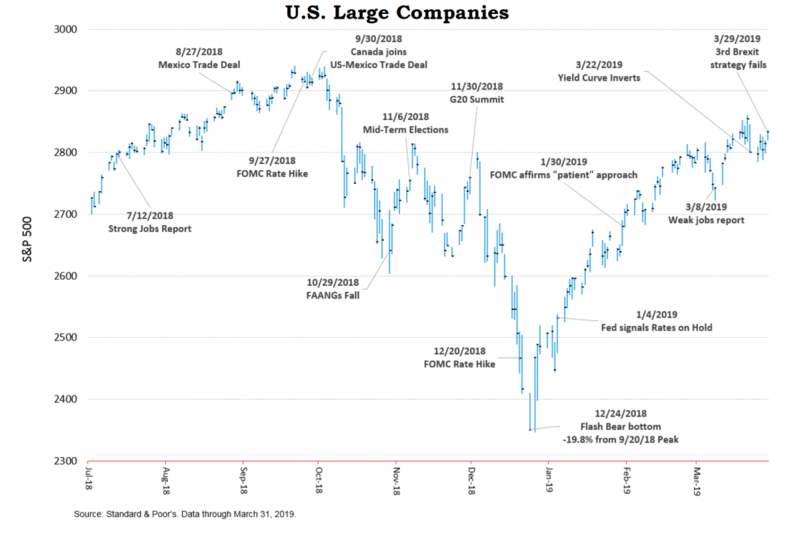 In the face of global economic slowing with cascading reductions in earnings estimates, stocks produced double-digit gains, interest rates plunged, and oil prices soared. Who would have guessed it? You cannot use logic to predict the short-term direction of any market, be it stocks, bonds or commodities. But you can have a plan that anticipates the very market conditions to which we have been exposed, good and bad. That plan should clearly define your goals and the resources available to fund those goals. It should include assumptions about taxes, inflation and expenses. It should analyze the historical risks and returns from various asset classes and recommend allocations which offer a reasonable probability for success, but without unnecessary risk. It should assume a portfolio that is broadly diversified, low-cost, tax-efficient and periodically rebalanced. Finally, it should allow for adjustments over time as your goals and financial situation change. That is exactly what the team at Wealthview does every day in partnership with our clients. What an honor and privilege to play our part in the effective stewardship of our clients’ financial resources. Best wishes for a pleasant spring.